The Council of the Nigerian Society of Engineers (NSE) is set on Friday to confer its Fellowship, the highest honour of membership in Engineering profession, on Engr. IfeOluwa Oyedele, an Executive Director, Engineering and Technical Services of Niger Delta Power Holding Company Limited. Engr. Oyedele, an Electrical Engineer has, a career that spanned both public and private sectors, and had been in active engineering practice for over three decades. The award is in recognition of his commendable achievements in the field of Engineering, according to a statement. During the 2019 edition of the award which also marks the 60th Anniversary of the Society, the President of the Nigeria Society of Engineers, Engr. Adebayo Mokuolu, (FNSE) will confer the honour on Engr. Oyedele among other colleagues who have attained the highest level of professional standards in various disciplines at a Gala Night taking place in Abuja, the Federal Capital Territory. Engineer Ife Oyedele (FRMN) is also a Fellow of the Risk Managers Society Of Nigeria. Prior to September 1, 2016 when Engr. Oyedele was appointed to his current position as the Executive Director in charge of Engineering and Technical Services at the Niger Delta Power Holding Company Limited, he had held many major top positions. He has over the years built a robust career that cut across engineering management, manufacturing, construction, venturing, governance and engineering consulting from 1982 till date. He has evidently proven his mettle in both the public and private sectors. Oyedele began his career with DAFEC Consultants as an engineer with responsibilities to design and prepare tenders for rural electrification projects. His responsibilities also included supervision and monitoring the implementation of projects. 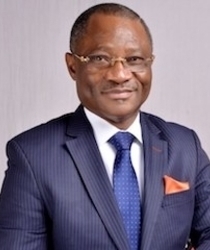 He later joined Oyo State Ministry of Works and Transport where he worked for two years with similar career responsibilities in his previous job.